If you know anything about me, you know that church plants are near and dear to my heart. And if you know anything about church plants, you know that no two are alike, no matter what books on church planting might tell you. Therefore, I was excited to receive this book, as it addresses a much more important part of church planting than 99% of the books out there—the hearts of the church planters themselves, and the people they serve. Gentry McColm. 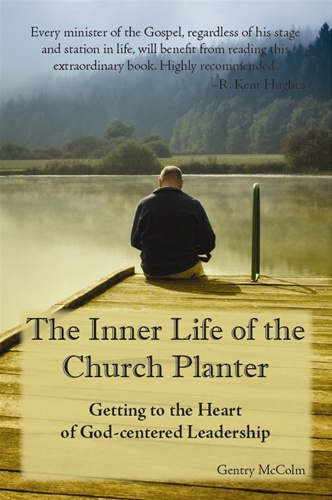 The Inner Life of the Church Planter: Getting to the Heart of God-centered Leadership. $12.00, 96p., ChurchSmart Resources. “When Jesus extended the invitation, ‘Come to me, all who labor and are heavy laden, and I will give you rest,” he gave us advance notice as to who would be coming to our churches. It would be the needy, the broken, those on the margins of society,” McColm says in his chapter on success. To make his point even clearer, he then launches into an exposition on 2 Corinthians 6:3-10, and the premise that Paul’s beatings, imprisonments, and general hardship were a much greater indication of success in God’s eyes than “numbers.” Planting requires integrity, endurance, and a heart to serve those God has placed you among, and McColm drives that home over and over. It’s also often lonely and frustrating, especially when trying to plant a church “cold” without any core group, as was McColm’s case as he planted Hope Church-Presbyterian in West Pearland, Texas. And as he points out, planting in a “more Christian” part of the country is no indicator of success, and brings its own problems. But as McColm discovered his own calling to “love and teach,” it freed him and those around him to pursue this vision the way God intended. The two appendices – a look at core values through the lens of Titus, and a reprinting of Robert Murray M’Cheyne’s sermon “The Love of Christ” – also drive home the importance of loving, enduring, and letting go of control. If anything, I wish McColm had included more personal experiences in the book. But he includes enough of them, and what he’s learned from them, to help the future church planter better understand the unique challenges he or she will be facing. Instead of a plan, we get someone walking alongside. And personally, I think that’s a lot more useful. This entry was posted in Uncategorized and tagged book review, church planting. Bookmark the permalink.